Recorde: March 2008, Tau Recording Studio, Acireale. I couldn’t stop listening to it. What a pleasure! This recording definitely has something special happening, and it's full of magic. Prosseda reaches a lyrical ardency and tenderness as well as a culture of pianissimo playing that beg to be matched. Mendelssohn's precious gems are shining than ever before. piano miniatures in one sitting, but Prosseda is such a master pianist that you forget the limitations Mendelssohn showed in some of the works. As their title suggests, these are songs and should be played as such on a piano – not easy to do, because the percussive instrument cannot sustain the tone for long. Prosseda has a magic touch and at times his tone exceeds what one would hear even from the true masters of the piano. Listen to the six Lieder from opus 102 and you will hear in a nutshell what Prosseda can make the instrument do. I honestly doubt anybody will be able to challenge him in these Mendelssohn works. Outre son évidente valeur documentaire, ce double album présente un réel intéret esthétique. Prosseda dépoie un jeu fluide et équilibré, une sonorité très amène et s'adapte remarquablement aux rondeurs ou aux effervescences qui ponctuent ces cahiers. 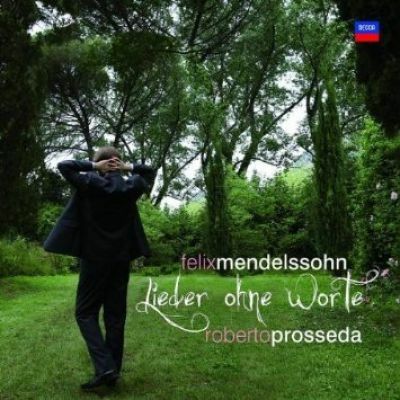 Prosseda's devotion to the music of Mendelssohn revelas itself in his compelling accounts of the Songs without Words...Notoriously difficult to bring off convincingly, they require a sensitivity to line and texture of almost Mozartian proportions. This is where Roberto Prosseda scores so highly. His scholastic devotion to Mendelssohn stretches back many years, and yet he plays thus poignant microcosmos with a freshness and supreme naturalness that sounds almost as though he is discovering their embracing magic for the first time. Even when Mendelssohn is at his most elf-like (as in the famous "Bee's Wedding"), Prosseda shapes the music in long, elegant phrases that soar and compel utterly. Alongside Daniel Baremboim for Deutsche Gramophone, this is the finest set of Mendelssohn's Songs without Words now available.